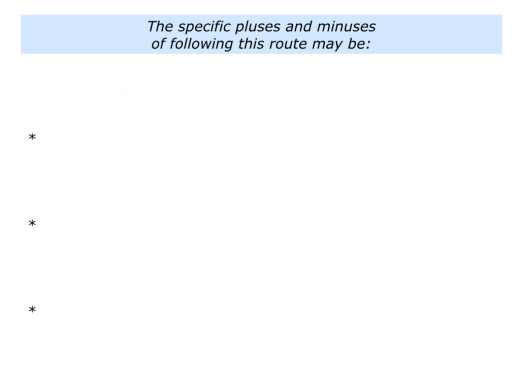 There are several routes that people can take in their professional lives. Here are three possibilities. 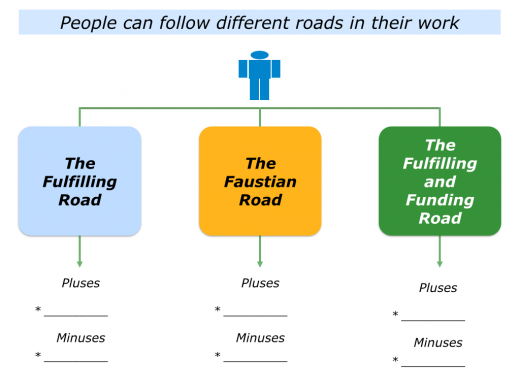 They can follow The Fulfilling Road, The Faustian Road or The Fulfilling and Funding Road. There are, of course, pluses and minuses to following each road. 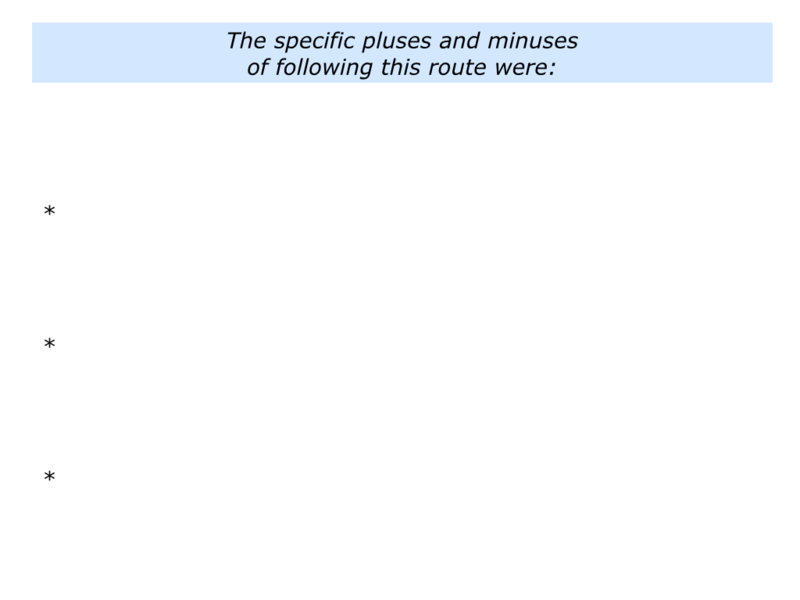 Let’s consider these possible routes. Some people simply focus on doing work they find fulfilling. They do what they enjoy and are not too concerned about money. They may focus on music, dancing, painting, teaching, inventing, designing, architecture, computing, selling, psychology, cooking, nurturing or whatever. 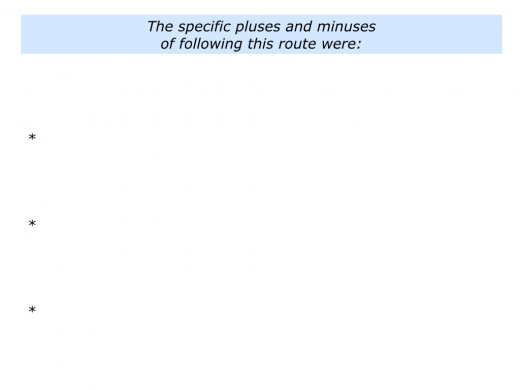 Many peak performers take the fulfilling route early in their working lives. Later on, if appropriate, they may have learned how to get paid for following their passion. Looking at your own life, have you ever done such work? You may have pursued it to do what you loved, follow a dream, help other people or whatever. 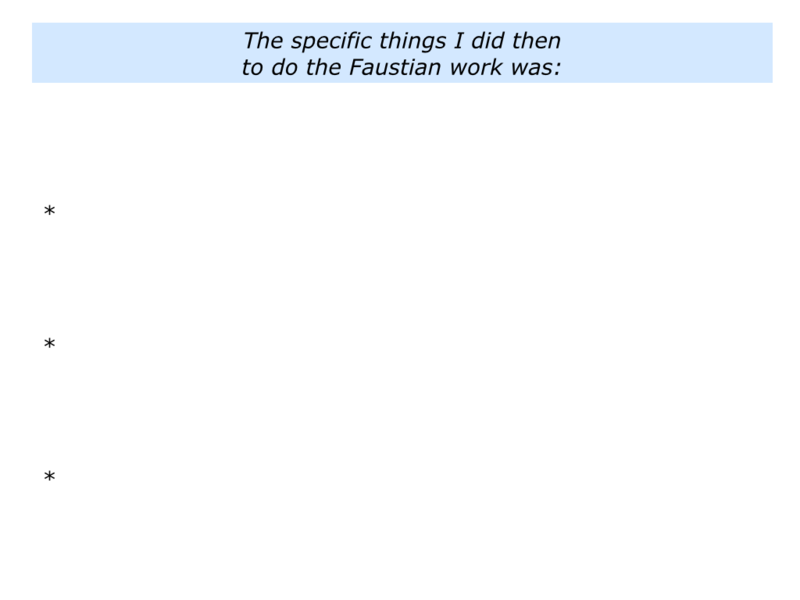 Describe a specific time when you did fulfilling work and were not concerned about funding. 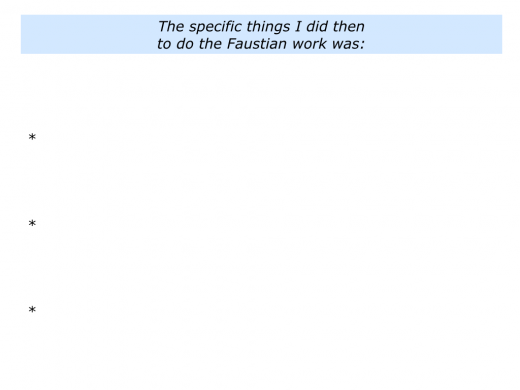 Describe the specific things you did then to do the fulfilling work. Describe the specific pluses and minuses of following this route. Climb the ladder and get a good position that will provide security … Take a job that has prospects – it may be boring, but you can do what you enjoy on the weekends … The work may be mind numbing, but the job has a good pension. If a person sells their soul, however, they may find it hard to reclaim their life and enjoy the anticipated rainbows. Looking at your own life, have you ever done such work? You may have chosen to do it to pay for education, clear debts or stockpile some cash. 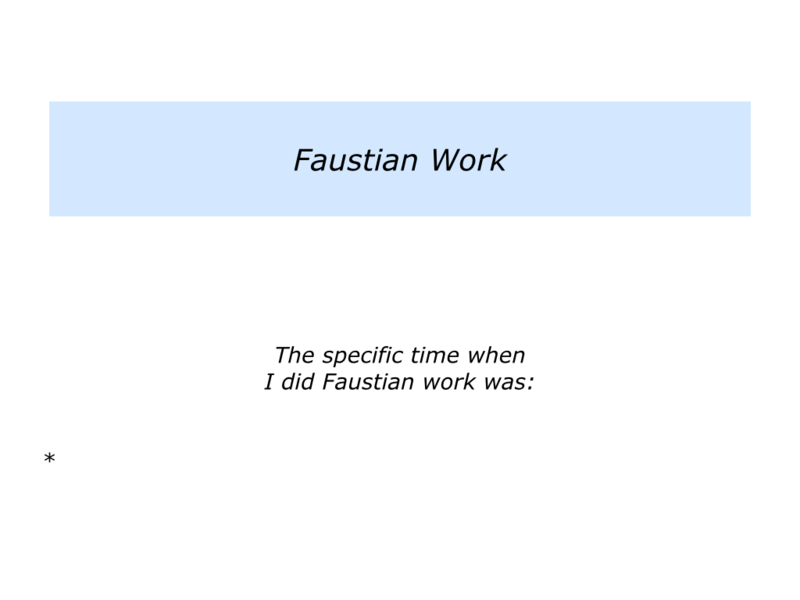 Describe a specific time when you did Faustian work. Describe the specific things you did then to do the Faustian work. Some people learn how to do fulfilling work and get funding. They find potential sponsors – people who will pay them for doing what they do best. They then use their talents to help those sponsors to succeed. Such people learn to balance their soul work and salary work, their mission and mortgage. Some do it by going freelance. Others create their perfect role in an organisation. They use their nous to craft a role that is a win-win for both themselves and the employer. Great service givers, for example, learn how to build on their strengths, find sponsors who will pay them and deliver success. This has been the road followed by creative entrepreneurs throughout history. They do this by following certain rules. They build on their strengths. They clarify the deeply satisfying activities in which they deliver As, rather than Bs or Cs. They clarify their perfect customers – the kinds of people with whom you work best. Looking at these potential sponsors, they clarify the challenges these people face and their picture of success. They reach out to sponsors in a way that fits their own values system. They recognise that most work will come from their network – the people they know or who may recommend their work. They keep giving to people in their network. Different people do this in different ways. For example, some keep having informal meetings with the potential sponsors. 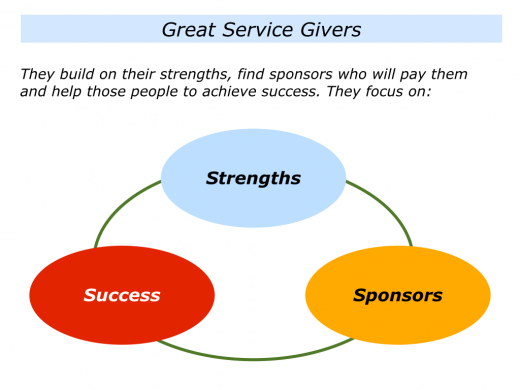 Great service givers recognise that people buy success, rather than the theory of success. So they share practical tools that the sponsor can use to tackle challenges and achieve their goals. Providing the service giver plants enough seeds, at some point somebody says: “How can we take this further?” They then move on to making clear working contracts about what must be delivered and by when. They get some early successes, perform superb work and help the sponsor to reach their goals. This frequently leads to further work – either with that sponsor or with others in their network. Great service givers build a good reputation and enable their customers to achieve ongoing success. Many more people are learning how to follow this road in their own ways. They are doing fulfilling work and also learning how to get funding. You can discover more about this approach via the following link. Looking at your own life, how might it be possible to take steps to do this in your own way? If you wish, try tackling the exercise on this theme. This invites you to do the following things. Describe the specific fulfilling work you want to do where you may be able to get funding. Describe the specific things you can do to do this fulfilling work and get funding.